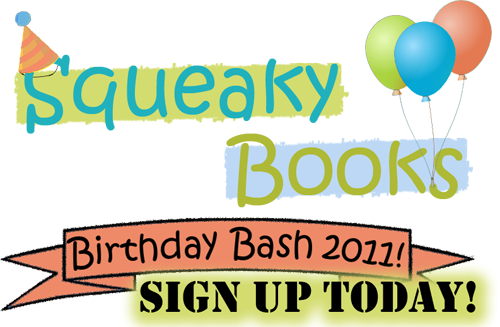 Squeaky Books: Squeaky Books Birthday Bash 2011 Sign Ups! Well, it's July. Do you know what that means? It means that it's time to start getting ready for the Squeaky Books Birthday Bash 2011! Many of you weren't here for the Squeaky Books Birthday Bash 2010, but if you want to see all of the fun stuff we did, you can click here. The coolest thing about the birthday bash is that it requires a lot of interaction with other bloggers. The birthday bash isn't possible without you! I love guest posts during the birthday bash! This year's theme is "The Best Birthday," so from guest-poster's I'll be looking for you to write about your best/most interesting birthday. This can be a true story about an actual birthday you had, or you can write a fictional short-story. Either one! ANYONE AND EVERYONE CAN BE A GUEST-POSTER. There are no strings attached to this one. I hope y'all will be interested in this one. Basically all you do is host a contest on your blog for the birthday bash. I'll write the contest post for you, and all you have to do is post it at the appropriate time. This way I send my readers to discover your blog, and you send your readers to discover my blog. See how it works? Last year the people who hosted contests for the Birthday Bash gained an average of around 100 followers, and you get some major love from me personally. Last year there was no requirement for hosting a contest, you just had to have a blog. There is a requirement to host a contest this year. Due to the fact that the birthday bash last year cost me well over $100, I am asking that contest-hosts either buy their book and mail it to me, or send me an Amazon.com gift card so that I can buy the book (which is what I prefer). Most books range from $10-$13. I will send you a list of books you can choose from, so you can be sure to host a contest for a book you're actually interested in. I ask that you send the book to me/send me a gift card because last year there was some problems with so many hosts mailing out the books. Things got lost. If you don't want to donate you can still sign-up to host a contest, but you will only ACTUALLY host one if I can find a prize for you. This is not a guarantee. the only way to be SURE that you will host a contest, is if you send me a GC for the book. You can be international, a book blogger, a non-book blogger, etc. You just have to have a blog. The birthday bash will run August 22nd - September 22nd. Contest hosts will be assigned a book in early August. I pay for all of the shipping for all of the prizes. Last year shipping alone cost me $50, and so I have set up a donation button on the left sidebar for anyone who wants to donate. Even $1 helps! I'm not going to use this money for anything other than shipping costs, and I'll take down the button if I get to $50. This is completely optional! I don't use my blog for profit (I don't believe in ads), and I was really skeptical putting up a donation button. But I figured it couldn't hurt to try. You don't need a paypal account to use this button, just a credit/debit card. All right, if after reading ALL OF THAT, you're still interested, you can fill out the form. You don't have to fill out the form to be a shipping-donor, just click the "donate" button off to the side. You can fill out the form below, or CLICK HERE if you want to see it in a separate window. THANK YOU! I'm hoping the bash will be a roaring success. I'm currently contacting some fabulous authors in hopes of interviews/guest posts/more giveaways. Fingers crossed! I signed up! Thanks for doing this.